And Meyer lemon. A wonderful combination! 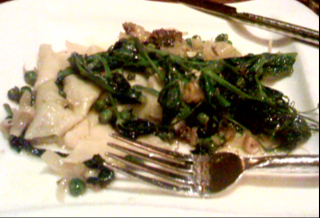 These were homemade ravioli, with homemade ricotta, with a sauce of English peas, shallots and Meyer lemons. Topped with wilted pea shoots. It was like tasting spring. (At JSix, the restaurant at Hotel Solamar).